I flew to Melbourne and back recently, which is no bad combo since I really like flying and I really like Melbourne. Actually, I love Melbourne. And I love flying too. If my whole life was nothing but a series of flights to and from Melbourne, with maybe a week or so in between to enjoy the endless delights of the great southern capital, I think I’d be set. But I digress. The point I really want to make is how much I love flying. Flying is so very convenient – how else could we cover the 700km between Sydney and Melbourne in around an hour? Flying’s also become so affordable that if you aren’t too choosy about the time of day you travel it can sometimes be the cheapest option. I admit that the idea of spending twelve hours on a bus or train to get me from point A to point B has never featured on my bucket list, but that’s not because I’ve been vehemently against either option per se, there’s just never seemed any point. And with sometimes less than $20 separating the cost of a bus, train and air fare, I can’t fathom why anyone would ever choose ground transport over air transport. In fact, I love flying so much that, aside from the tedium of getting in and out of airports, through security checkpoints and on and off the aircraft themselves, there’s not much for me to find fault with at all. But hang on… this is me we’re talking about so clearly, as with almost everything, there are aspects of air travel that I consider as rant-worthy as anything else. And as with almost everything else I rant about, most of what gets me fuming about flying is rooted in my obvious dislike of so many aspects of 21st century human behaviour and of people generally. 1. 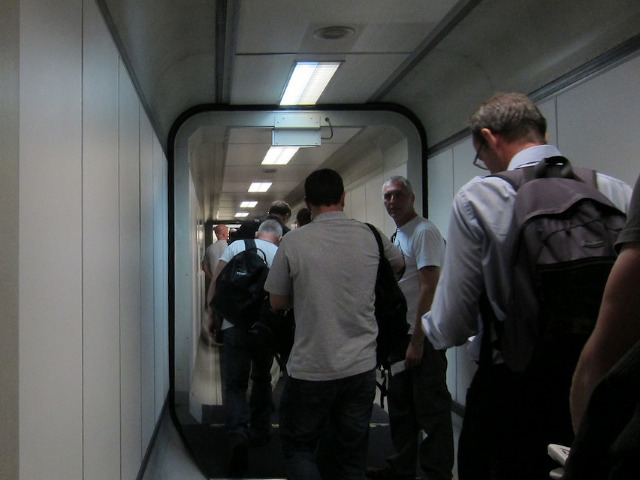 WHY DON’T ALL AIRPORT GATE LOUNGES INVITE PASSENGERS TO BOARD IN A LOGICAL, ORDERLY MANNER? Same airline. Different airport. One does. One doesn’t. I don’t get it! Why can’t they be consistent… and, more to the point, consistently do it!? Seriously, how can airlines not have worked it out by now?! Gone are the days where domestic air travel called for your Sunday Best and was restricted to the privileged few who could actually afford it. It’s been opened up to the masses now and the inescapable truth is that people en masse are stupid, chaotic, mob-like and hugely self-interested. Even without any specific request for the throngs of advancing passengers to do so, clearly those who manage most gate lounges at large domestic airports in Australia expect 330 people to queue in an orderly fashion, such that those holding tickets to the highest-numbered seats at the rear of the aircraft naturally go ahead of those seated towards the front who, in turn, naturally wait patiently because, obviously, it would be quicker to let those further back go first and, besides, the plane’s not exactly going anywhere without them anyway. Obviously that’s what they expect to happen. Unsurprisingly, the reality is somewhat different. Compounding the situation is that virtually everyone now seems to fall into one of the plethora of categories that used to be called as a ‘special condition’. By the time the gate staff have welcomed aboard first class passengers, business class passengers, , premium economy passengers, airline club members, frequent flyer members, rewards club members and members of partner-airline programs, the elderly, pregnant women, parents with small children, unaccompanied children and those with mobility considerations, there’s hardly any childless, unrewarded, fully-functional young-to-middle aged plebs left! 2. WHY DOES HALF THE POPULATION OF THE GATE LOUNGE STAND UP AND FORM A QUEUE 10 MINUTES BEFORE BOARDING’S EVEN DUE TO COMMENCE? I daresay point 1 goes some way towards answering this question too, but I still don’t get it. OK so some airports are possibly guilty of furnishing their gate lounges with hard, upright seating and carpet that looks like the pattern was vomited onto it after ten-too-many shots and some brightly coloured cocktails, but they’re not all as bad as that! Honestly, garish decoration notwithstanding and irrespective of whether passengers were called up in a logical, orderly manner, I can’t remember the last time I was in an airport gate lounge and didn’t witness at least 50% of passengers standing for at least ten minutes before boarding’s even due to commence, gradually adding to a queue that weaves its way out into the concourse and back into the other end of the gate lounge. Why do they do it? 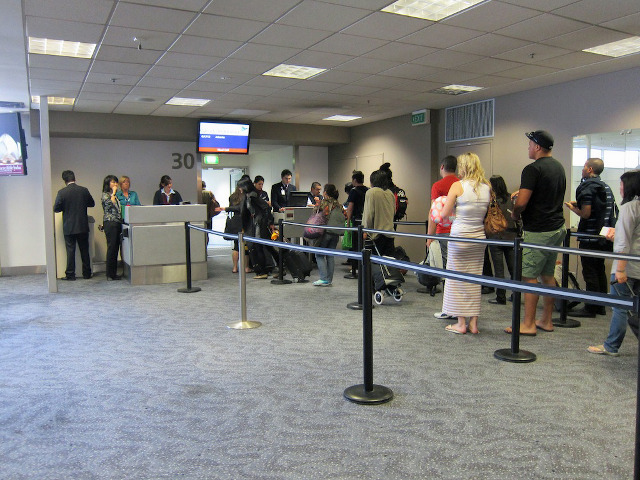 With such inconsistent application of orderly boarding practices, there’s a very great risk that they’ll just have to wait while others are called ahead of them anyway. And even if that doesn’t happen, that snake-like queue’s only going to feed them slowly onto the aircraft and into a log-jam of passengers all trying to get to different seats and stuffing over-sized bags into overhead lockers at different points along each aisle; in the end, it’ll take them just as long to reach their seat as it would’ve done if they’d just exercised a little patience. What do they think’s going to happen anyway? They’re virtually on top of the plane, so the likelihood of it flying off into the sunset sans-them can’t be all that great? 3. WHY MUST EVERYONE TRAVEL WITH CARRY-ON BAGGAGE THAT’S VIRTUALLY A FULL-SIZED SUITCASE? Is it any wonder so many people are gagging to be first on board, with more airlines taking a ‘more for less’ approach to checked baggage by the day? That’s to say, “we charge you more, you take less”. Even airlines that don’t impose a checked baggage restriction or charge suffer the carry-on baggage curse. Harking back to point 1 again, if gate lounge staff don’t board passengers in some kind of logical order, the result is hundreds stashing their full-sized suitcases all over the place. By the time the majority of passengers are on board, most overhead locker space is inevitably gone and some have to stow their baggage somewhere other than the overhead locker nearest their seat. There are also random outbreaks of pass-the-parcel as one passenger does a deal with another to swap the location of their carry-on luggage – as if the passenger log-jam in the aisles wasn’t already bad enough. I guess it’s understandable though. I’ve had to do it before and, even if only to a limited extent, it’s a tad unnerving knowing that your bag is somewhere down along the aisle, several rows either side of where you’re sitting. If it’s not crammed full of stuff that you just can’t live without for the fifty minutes’ duration of the flight and it’s securely locked there shouldn’t be any issue, even if you can’t see it. But, of course, the modern flyer is a 21st century beast, not widely known for logical thinking, forward planning or considering the needs of those around them, so virtually everyone who stows suitcase-sized carry-on luggage inevitably has to get something out of it. Wisely, they usually choose to do so while others are still trying to take their seat or still trying to discover the location of that one remaining space big enough to stash their own suitcase-sized trunks. And invariably, that item they couldn’t do without is something they could’ve carried on in their handbag, manbag, bumbag, pocket or hand. How is it that so much time in the modern corporate world is given over to efficiency and efficiency gains these days, yet at an individual level efficiency seems to be the last thing on anyone’s mind?! 4. GO TO THE TOILET BEFORE YOU LEAVE! Isn’t that what your Mum & Dad always said as you were growing up, every time you went anywhere? So how come everyone has to get up as soon as the seatbelt sign goes off? Seriously, last flight I was on, within 60 seconds of the seatbelt sign going out, there was a queue of nine people in both aisles waiting for the two toilets at the back of the plane. What were they thinking before they left home? Or as they passed a multitude of bathrooms from the moment they stepped foot in the airport? Or for the twenty minutes before they boarded? One guy I saw went three times! It was only a 56 minute flight FFS! Clearly there’s an untapped market for Depend Undergarments on short-haul flights! 5. TURN YOUR DAMN PHONE OFF! I don’t know about you, but I have zero understanding of how leaving a mobile phone switched on during take-off can interfere with a plane’s navigation systems. Apparently, though, loads of other people do understand and clearly believe that there’s no possibility of their phone interfering with anything because they flatly refuse to turn them off or even to put them into any kind of safe in-flight mode. So either they’re intimately familiar with the complexities of something that most of us, not surprisingly, don’t have a clue about, or they just don’t give a toss and couldn’t care less if their need to stay cellularly connected was the cause of hundreds of people dying as a result of the aircraft falling out of the sky due to unexpected interference with its navigation systems. Next time your arrogance leads you to decide that leaving your phone on during take off and landing is OK because you clearly know better than anyone who ever made one of those announcements about turning it off, you’d better hope that plane doesn’t hit a sea wall thanks to unexpected interference. You’d also better hope you’re not sitting at the back. 6. WHAT’S THE GO WITH SQUEEZING THREE SEATS INTO EACH SIDE OF THE AISLE ON BOEING 737-800s? Seriously, what’s the go? Were 737s a bespoke design, only ever intended to carry children, EMOs and people with eating disorders or wasting diseases? It’s not as if I’m morbidly obese or anything – I’m about 6’2”, I eat normally and I exercise regularly. Even so, I thought these sardine-esque aircraft accommodations had been relegated to the past years ago! Really, there’s nothing I enjoy more than jamming my legs into the back of the seat ahead of me, not having sufficient space to lay my tray-table flat as a result, not being able to sit back in my seat and having to adopt a corpse-like pose with arms folded across my chest, hands resting on each shoulder, just to have somewhere to put them! Seriously, last time I looked, the average Australian just wasn’t that thin! Or that short. 7. WATCH THE DAMN SAFETY DEMONSTRATION! No really, go on – watch it! I’m almost daring you to watch it! It won’t kill you… well, clearly it won’t since you’re apparently so familiar with the ins and outs of dealing with an emergency situation on this very aircraft that you don’t need to pay any attention to the safety demo whatsoever. I bet you’d be the first one to fly into a panic, with absolutely no idea what to do in a real emergency, too. You’d probably rip the last remaining life jacket from a small child or an old lady, wouldn’t you? I hope you drown. Arrogant tool. 8. WHY MUST YOU BRING THE ENTIRE CONTENTS OF YOUR LIFE ON BOARD, THEN STAND IN THE AISLE HOLDING EVERYONE UP WHILE YOU DECIDE HOW TO ARRANGE IT ALL? So it’s taken you this long just to get to your seat… OK, not your fault. The gate lounge staff clearly didn’t call anyone up with any semblance of order, so I guess you didn’t have much choice in the matter. But there you are with that carry-on luggage that’s virtually a full-sized suitcase and, dear-oh-deary me, don’t you have that thing stuffed just as full as you could conceivably get it without causing it to explode!? Of course you also have a handbag/manbag/bumbag and some pretty hefty pockets right there, don’t you? I’m guessing none of them have anything much in them, right? Too uncomfortable or heavy or whatever to have to walk all the way through the airport with shoulder bags and pockets full of stuff, right? So now you’ve finally found the right sized gap for your suitcase-sized bag, I guess there’s all kinds of things inside it that you’re gonna have to get out of it? You know, just to make your 56 minute flight that much more comfortable and enjoyable – am I right? You know I’m right. Out come the keys to undo all those padlocks… whoops, look out, two or three of those people banking up behind you actually need to get past. But that’s OK, just stand there and make a superficial attempt at moving aside despite the fact that you’re standing right in front of your own seat which you could’ve maybe dipped into the gap of since, clearly, you’re no actually sitting in it… but anyway, you’ve gotten all those padlocks undone now – out comes the travel pillow, the 650 page novel… hold on, couple of others need to get past again… oh no, one of them’s sitting right across the aisle opposite from you and they want to start doing exactly what you’re trying to do – how selfish of them, pushing past you like that, tut-tutting as they go… anyway, you keep on fossicking away there… out comes the newspaper, the magazines, the water bottle… now the flight attendant has to get past you to help someone else who can’t even lift their suitcase-sized baggage… the leather-bound compendium, an iPod and earphones, some chewing gum. I really do think – and I hope you’ll agree – that it’s so important that you’re surrounded by all the comforts of home for the duration of a 56 MINUTE FLIGHT!!! 9. WHY CAN’T YOU JUST LEAVE YOUR SEATBELT ON UNTIL THE SEATBELT LIGHT IS EXTINGUISHED? Seriously! You’re at the back of the plane. Nobody’s mentioned any possibility of disembarking via the rear doors, so what possible advantage can you get from whipping your seatbelt off and bounding to your feet before the light’s even been switched off? It’s not like you can actually go anywhere! 10. SOME FLIGHTS ARE JUST TOO SHORT! So after all of this nonsense, no sooner are you in the air and you’ve gotten yourself all nice and comfortable than they start preparations for descent and you have to put it all away again! Couldn’t they go ’round a couple of times, at least stretch it out a little just to create some sense of having been in the air for longer than it took to get on and off the aircraft and in and out of the airport! Some flights seem to spend more time taxiing than they spend flying! When the total flight time’s 56 minutes, but the combined time of getting into and out of the two airports is something approaching two hours, it’s hard not to feel a bit cheated! But then, what would the Generation Y folk and anyone else in the habit of rehashing overused memes say about all of this? “First world problems”, maybe? They’d know. But what of the fatties Matt or aren’t you ”old man” enough to address that topic? Not 100% what you mean missgruntled. I thought my point 6 came out more than in support of larger people wanting a comfortable seat fit. Maybe you missed that? Or maybe you’re coming at it from a completely different angle? Perhaps you’re asking for my position on ‘fatties’ taking up more than one average person-sized seat? I might be ‘old man’ enough to tackle any issue, but without you confirming what you’re getting at I’m not silly enough to try.